Bring a salad to life with roasted beets, blueberries and homemade mustard dressing. Sometimes less is more when it comes to making a salad. Maybe it depends on what kind of mood I’m in, or whether I’m starving hungry or just hungry when I’m adding toppings to a salad. But this is one of those less-is-more salads with just a few main ingredients that can really hit the spot. 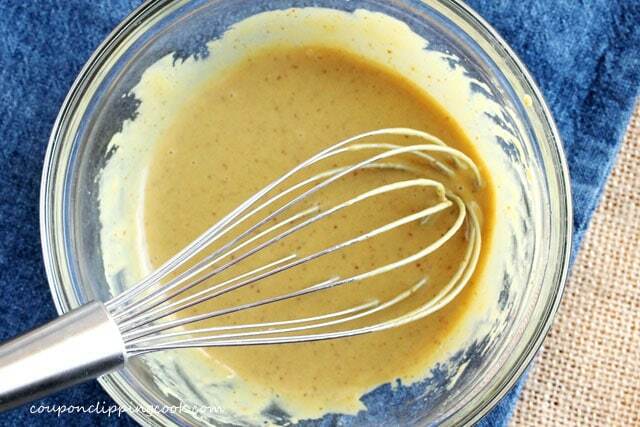 And also included in the recipe is a delightful homemade mustard dressing that’s quick and easy to make. 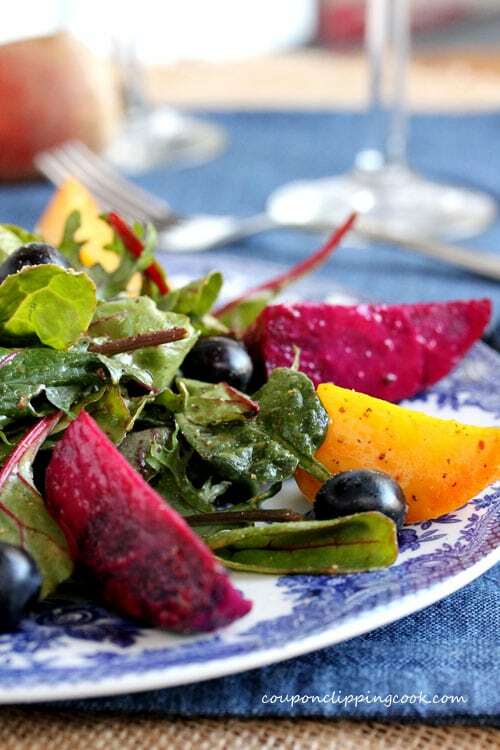 The beets add substance to the salad and taste wonderful with the mustard dressing. 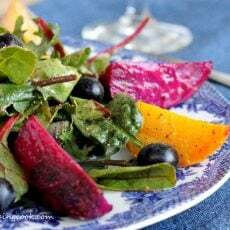 Beets are so colorful and pretty in a salad especially when using both gold and red ones. It’s so easy to roast them too. Just add them to a foil tent with a bit of olive oil, salt and pepper and that’s it. Plus of course putting them in the oven but that’s the super easy part. Once the beets cool the skin is removed using a paper towel to rub it off. When rubbing the skin off the red beets you just have to be careful not to rub your nose or face…especially when going out in public. And the paper towels with the red all over them look a little scary in the trash can. But other than that it’s a piece of cake to make roasted beets. 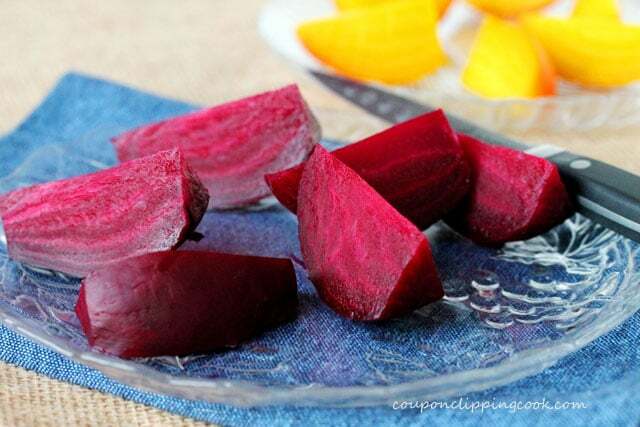 TIP – Cooked beets should last nicely in the refrigerator for 3 to 5 days. 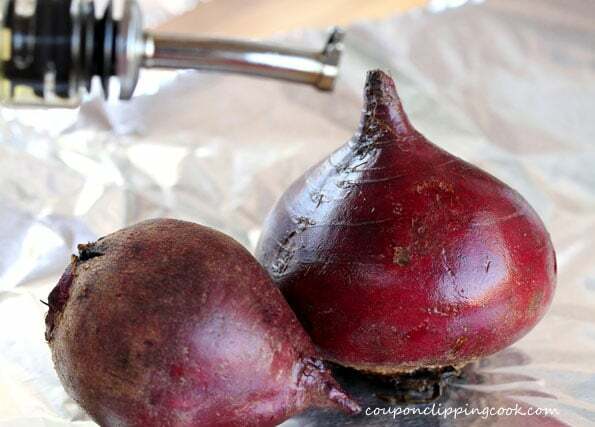 TIP – When storing cooked beets in the refrigerator it’s best to separate the gold from the red ones so the red beets don’t bleed red color on to the gold beets. Same goes when handling them too. Although the quantity for this recipe is more the size of a main dish, this salad makes a beautiful side salad too. Oh and feel free to add more toppings to the salad like goat cheese, feta cheese, or even blue cheese. And for some crunch, shelled and roasted pepita (pumpkin) or sunflower seeds taste great as a topping. 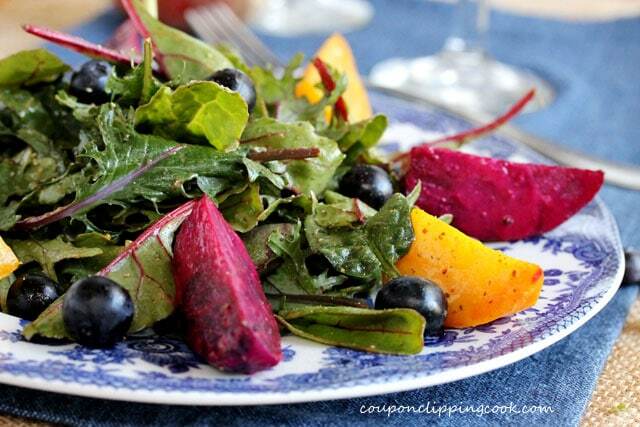 The mixed greens, colored beets, and blueberries make a nice “canvas” to add even more toppings to. The salad just gets prettier with more toppings and colors. Ok, I’ve reached my time limit on how long I’m allowed to talk about beets. Wash the beets and cut off the stems. 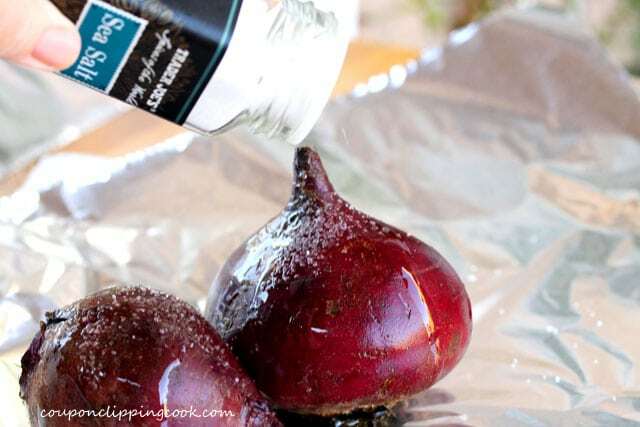 On a large piece of foil, add the red beets…. 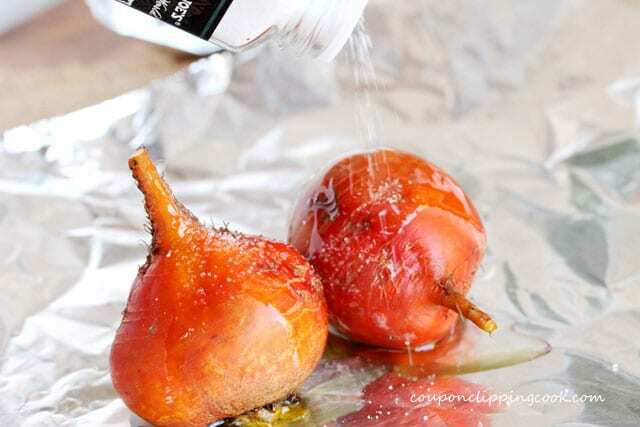 Pull all of the edges of the foil to the top of the beets, form a “tent” with the foil and seal the edges. 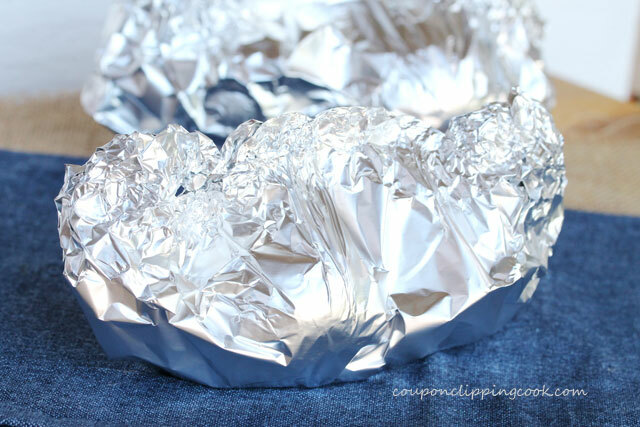 Form a tent over the beets with the foil. 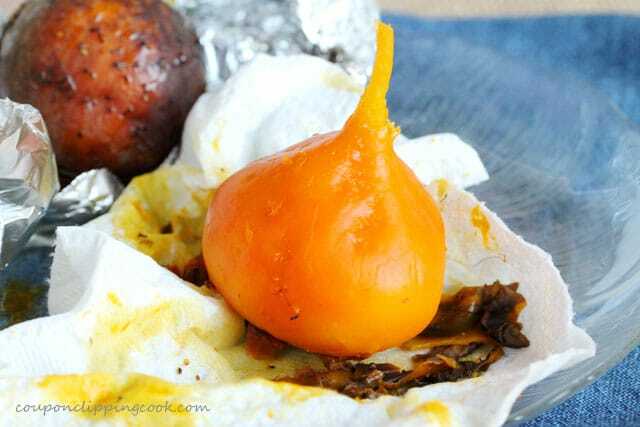 Set both foil tents on a small cookie sheet or pizza pan and bake in a preheated oven until the beets are tender (about 55 minutes; time may vary depending on the size of the beets). Remove from the oven and let the beets cool. 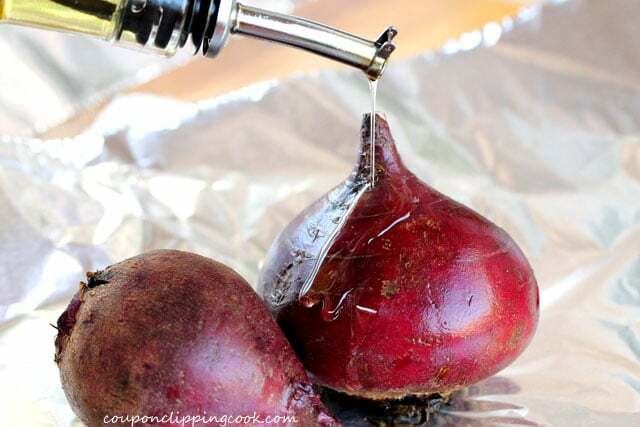 When the beets are cool, starting with the gold beets, use a paper towel to rub off all of the skin. 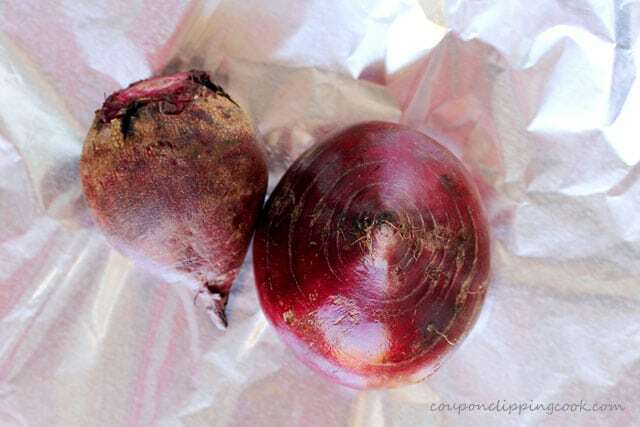 When you’re done removing the skin on the gold beets, use a fresh paper towel to rub the skin off the red beets. Then cut the ends off of the beets, and cut each beet into wedges. Set aside for a moment. 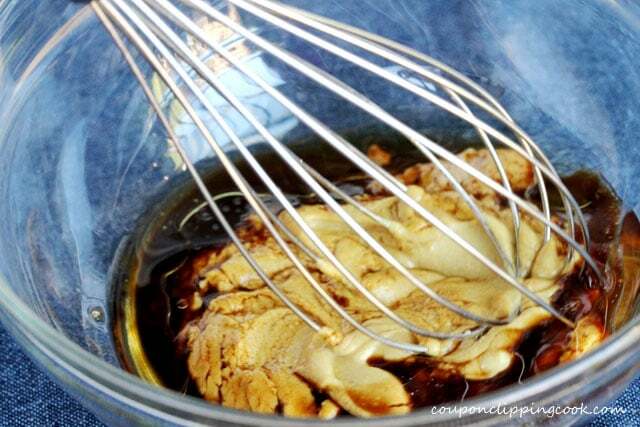 …until creamy. Set aside for a moment. 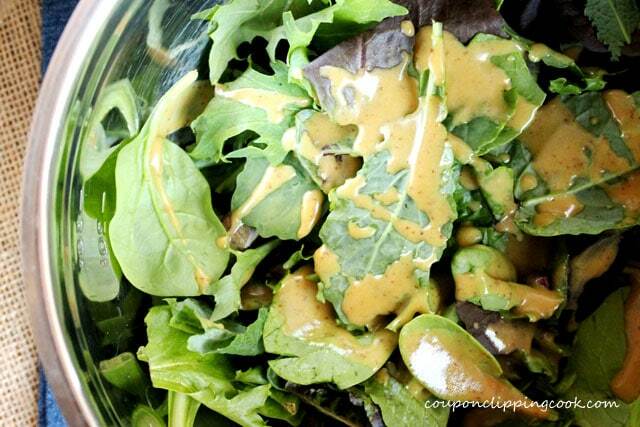 Dressing and Plating the Greens – In a large bowl, add the greens and about two thirds of the mustard dressing. 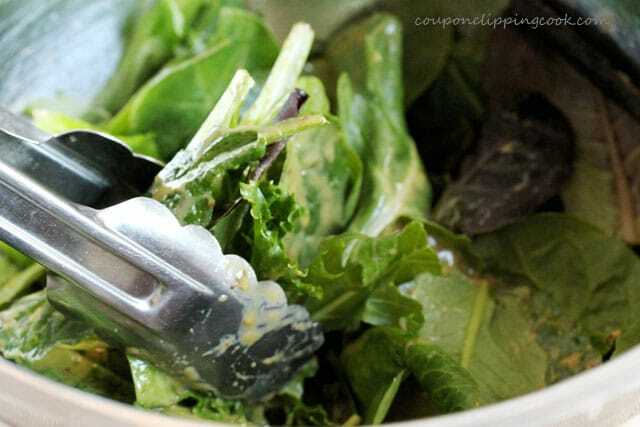 Using tongs, coat the greens with the mustard dressing. Transfer the greens to serving plates. Dressing and Plating the Beets – Add the remaining mustard dressing to a small bowl. Starting with the gold beets, dip one wedge at a time to coat the wedges with dressing. Set the beet wedges on the serving plates just to the outside of the mixed greens. 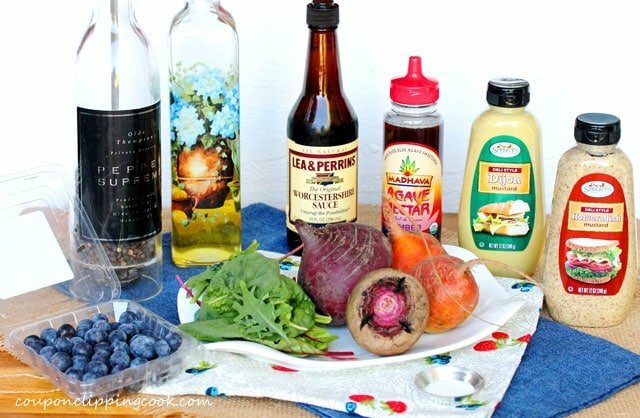 Add the red beet wedges one at a time to the remaining mustard dressing and coat each side. Set the red beets on the serving plates. 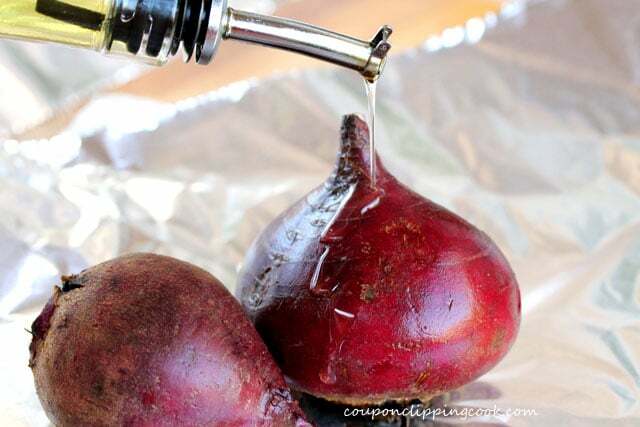 For the Red Beets - Wash the beets and cut off the stems. 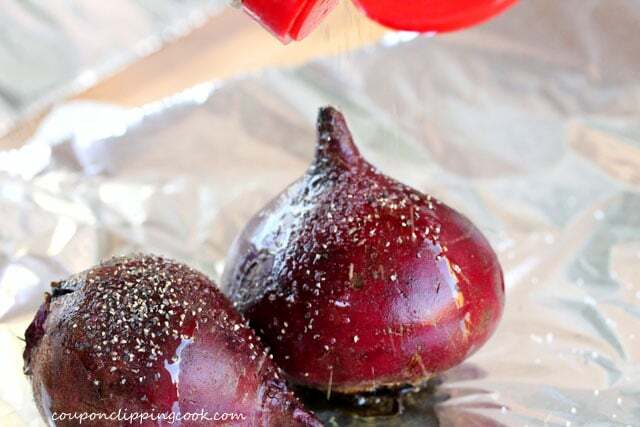 On a large piece of foil, add the red beets and ½ of the total amount of olive oil, salt and pepper. 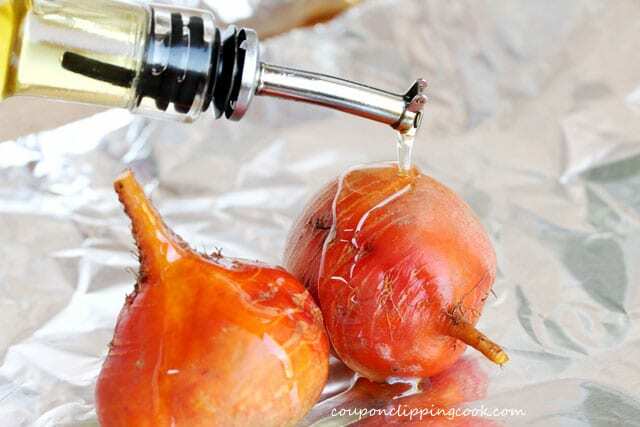 For the Gold Beets - In another large piece of foil, add the gold beets and top with the remaining olive oil, salt and pepper. 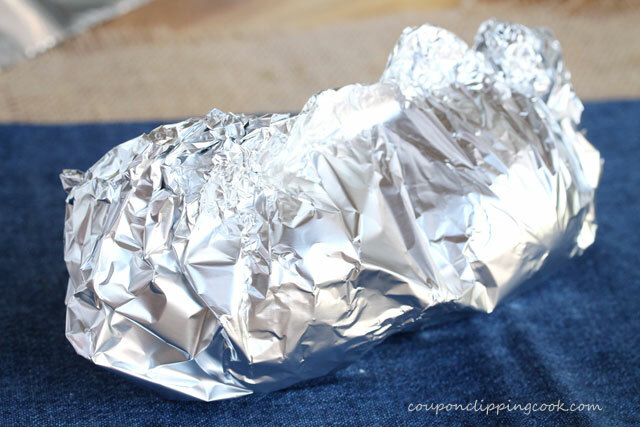 Form a tent with the foil and seal the edges. 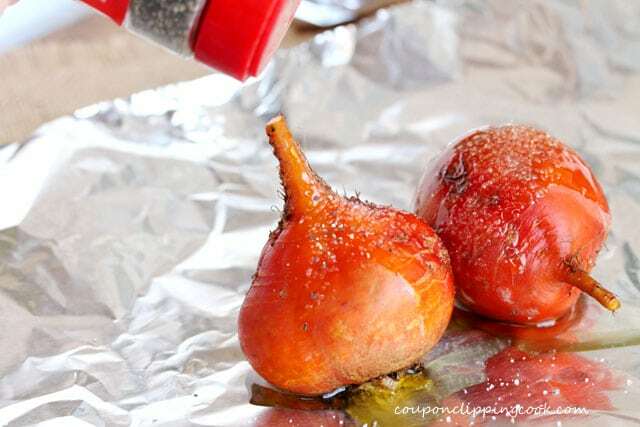 Cooking the Beets - On a small cookie sheet or pizza pan, set both foil tents. Bake in a preheated oven until the beets are tender (about 55 minutes; time may vary depending on the size of the beets). 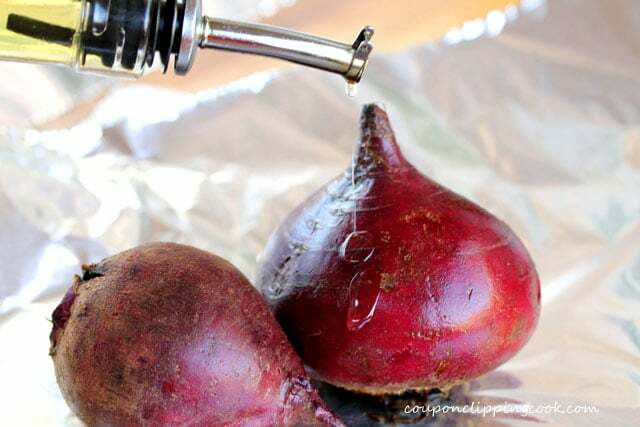 When the beets are cool, starting with the gold beets, use a paper towel to rub the skin off. Use a fresh paper towel to rub the skin off of the red beets. 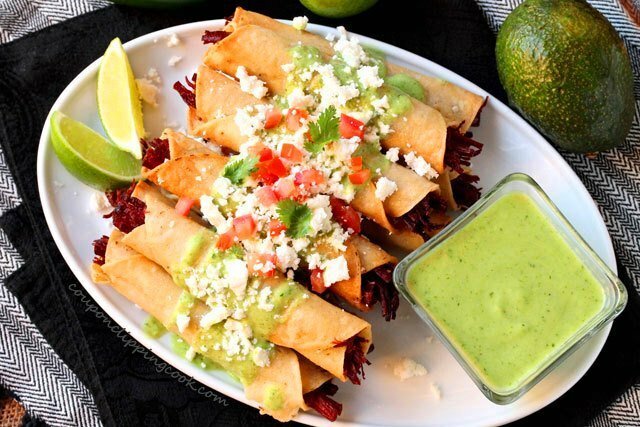 Cut the beets into wedges and set aside. 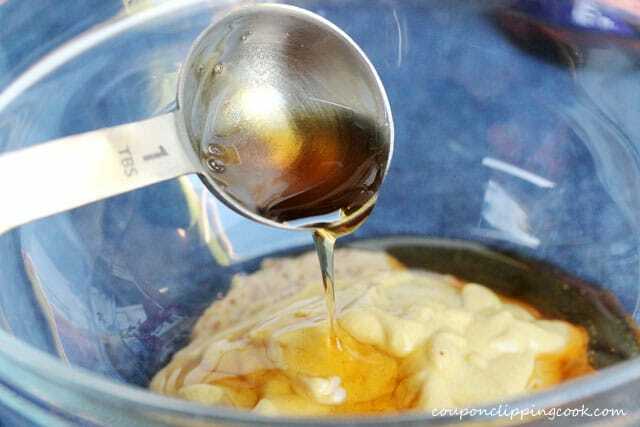 In a medium size bowl, add all of the ingredients and whisk together. Dressing and Plating the Greens - In a large bowl, add the greens and about two thirds of the mustard dressing. Using tongs, coat the greens with the mustard dressing. Transfer the greens to serving plates. Dressing and Plating the Beets - Add the remaining mustard dressing to a small bowl. Starting with the gold beets, dip one wedge at a time in the mustard dressing to coat the wedges with dressing. 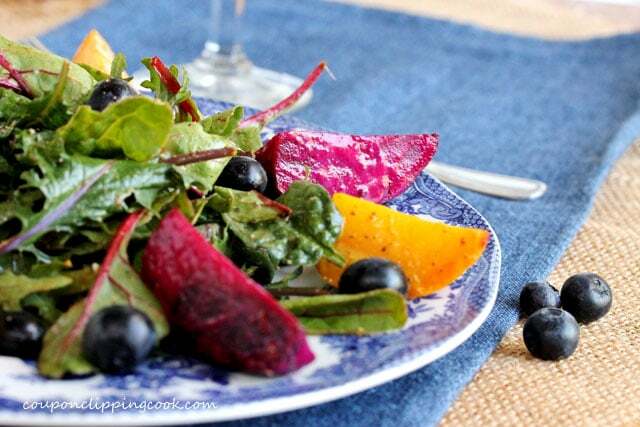 Top the salad with blueberries, a pinch of salt, fresh ground pepper and serve. Cooked beets should last nicely in the refrigerator for 3 to 5 days. 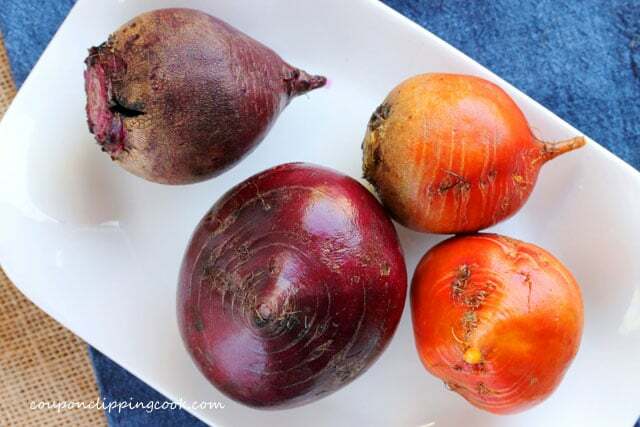 When storing cooked beets in the refrigerator it's best to separate the gold from the red ones so the red beets don't bleed red color on to the gold beets. Same goes when handling them too. 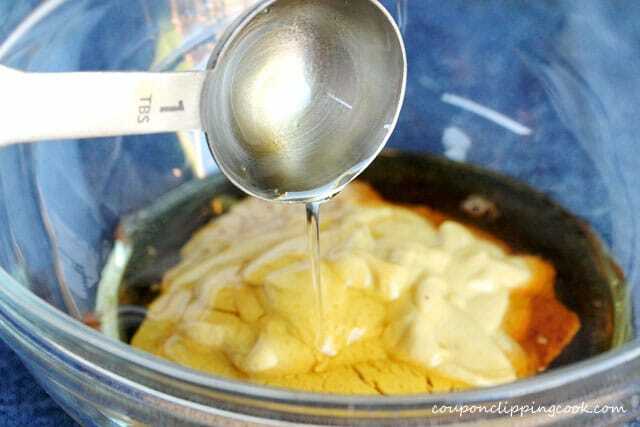 1/2 cup agave and 1/2 cup mustard for 2 TB of olive oil? Something isn’t right. Hi Michael, thank you so much for pointing this out. 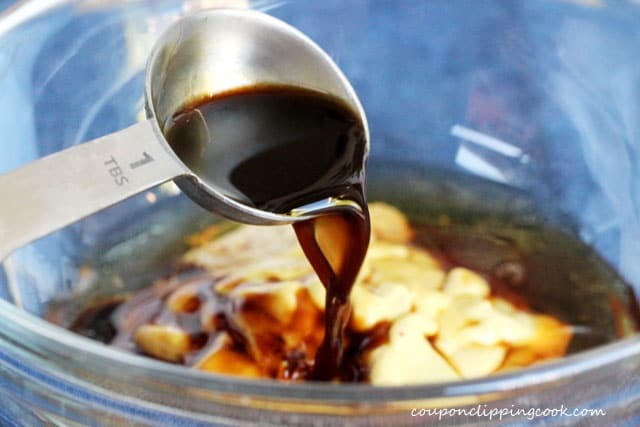 Update – I actually remade the recipe for the dressing and the amounts are correct. 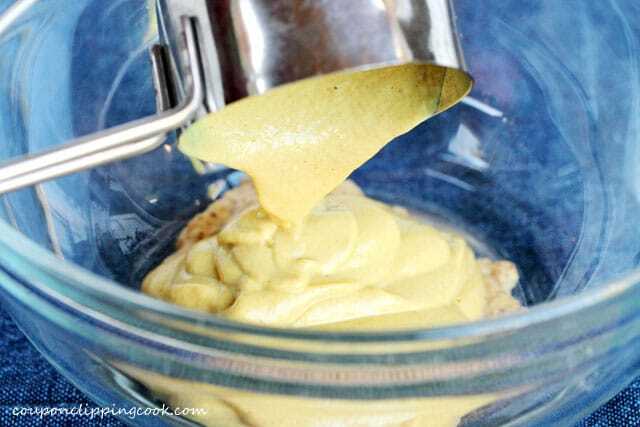 The dressing has a taste similar to a honey Dijon sauce only it has just a little bit if heat to it from the horseradish mustard. Thank you again!